Wrigley Roster Jenga: The Find of a Lifetime? This baseball has been sitting on my dresser for more than a year now, with the rest of my miscellaneous diamond memorabilia. Before that, it rested on my computer desk for several years, serving as something of a paper weight and decoration, something to bring a little bit of flare to my workspace. Honestly, I've never really known what to do with my autographed baseballs. 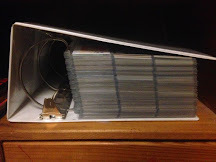 I do not have a lot of them, but (as you can tell) figuring out a proper way to display them has eluded me for quite a long time. This particular signed hardball came into my possession through my now sister-in-law, who generously bought it for me as a birthday gift a few years back. As I recall, she came across this bit of ephemera while browsing through a local thrift store one day. 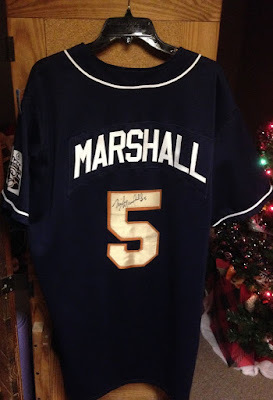 While she had no idea who had inked their name on the sweet spot, for a couple of bucks, she correctly surmised that it might make a fun birthday surprise for the biggest baseball fanatic in her social circle. She's always taken good care of me when it comes to gifting. The John Hancock was a mystery to me as well, perhaps a "Steve" or "Stan" someone who once played minor league baseball or something. With not much else to go on, I placed the ball on my desk, intending to come back and do some more in-depth research later. Finally, after kicking the can way down the road, this past weekend, I got an answer as to who might have scribbled on it. However, we'll come back to that in a little bit. 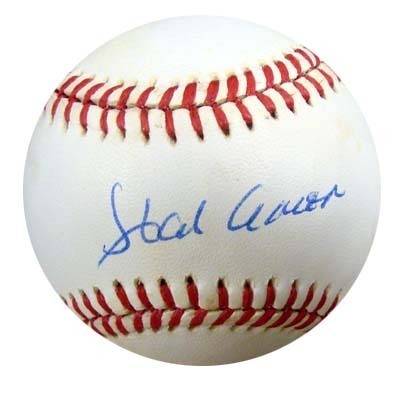 Before I reveal the ID of the mystery signer, I should note that this wasn't the first time that a graphed baseball had gone from a thrift store shelf to my apartment. Actually, just months before that gift from my sister, the local Savers provided the piece that you see above. 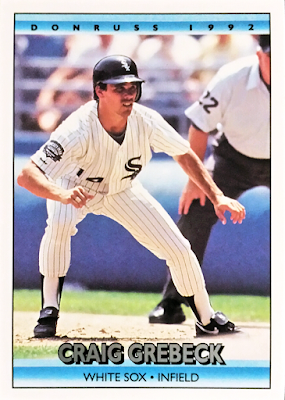 While he wasn't a star player, Craig Grebeck was a utility man for the White Sox, Marlins, Angels, Blue Jays, and Red Sox and had a lengthy 12 year career in the Bigs - not a bad autograph to find for the price of a meal off of the McDonald's Dollar Menu. Plus, the guy played for one of my hometown teams, which is always a major plus in my book (even if it's the wrong team). A couple of Christmases ago (note the tree in the background of these pictures), I was doing some shopping at the nearest Goodwill... not for seasonal gifts, mind you, but as a mental respite from the chaos and mayhem that is department store shopping during the holidays. 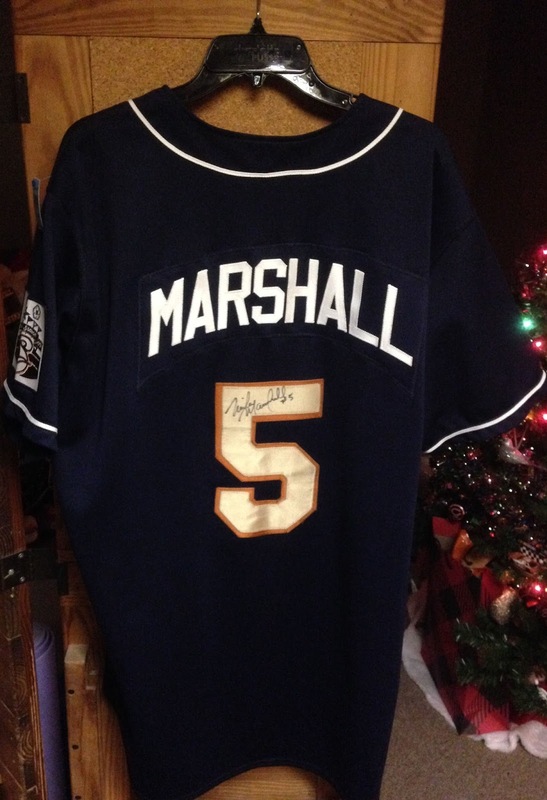 Anyway, finding this game-used, minor league baseball uniform signed by long-time Major Leaguer, Mike Marshall, certainly qualified as a welcome respite. 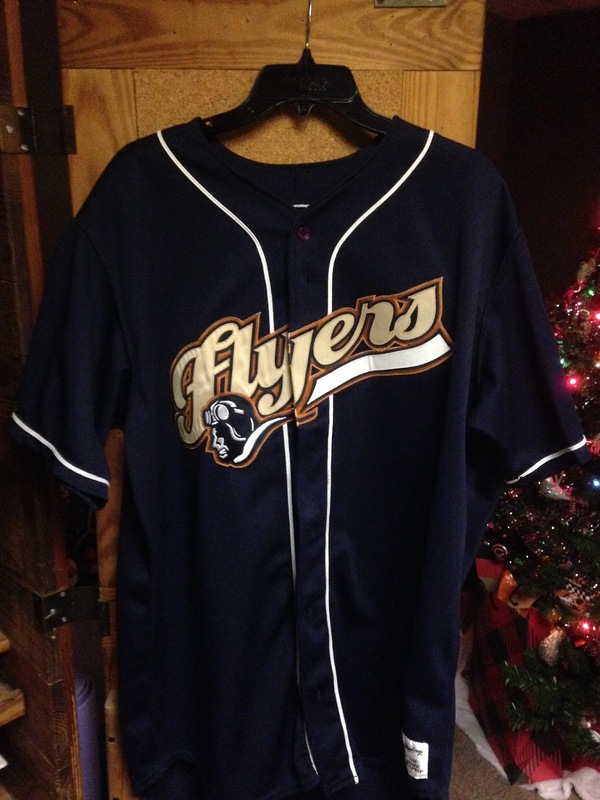 The former Dodger All-Star came back seven seasons after his last pro action to play 33 games for his hometown Schaumburg Flyers of the old Northern League in 1999. 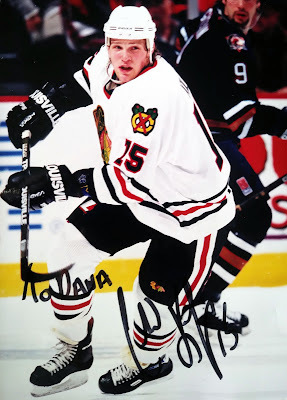 A couple of team-issued photo cards and a glossy 5"x7" featuring Blackhawk Sharpie marks! Steve Dubinsky, Ethan Moreau and Chad Kilger were once chased down by someone named Dana and then unceremoniously jettisoned into the secondhand market. 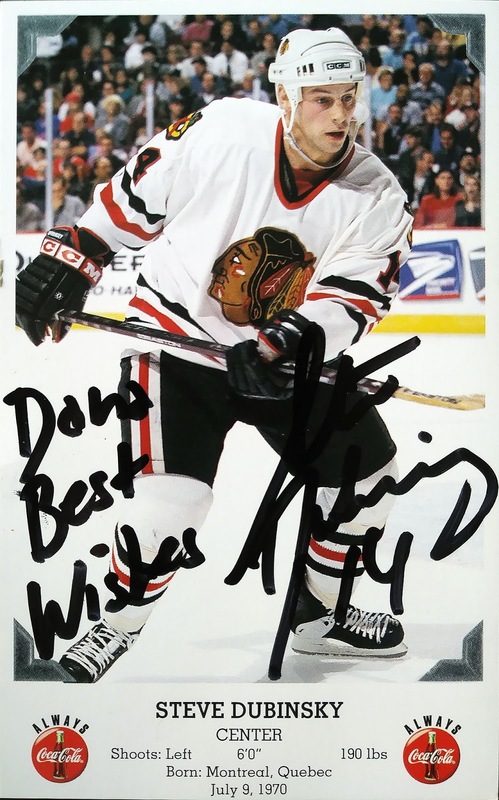 Seeing as Kilger only played for one campaign in the Windy City, 1998-99, we can probably say with confidence that those cards were released by the team in 1998. As for the origin of the photo print out, who the heck knows? All in all, these aren't scrubs - between the three of them, that's 38 years of combined NHL experience and a couple of big names from the dark period of the Blackhawks franchise. There was no way I wasn't going to rescue these from the store rack and proudly display them in my Blackhawks binder! 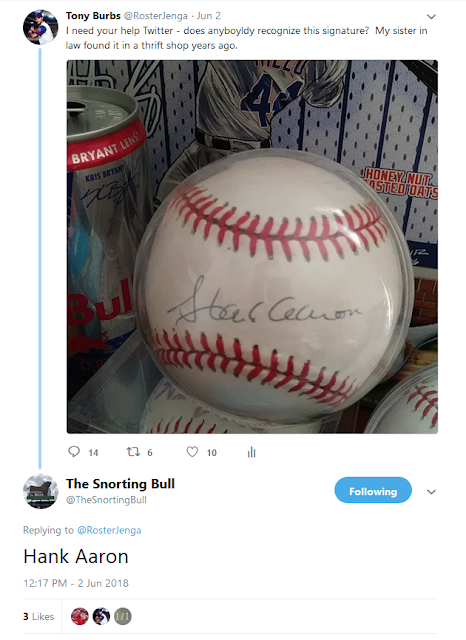 All in all, this is starting to sound braggadocios; that said, as you can see above, I've had some pretty good luck when it comes to acquiring signed memorabilia from the local Goodwill, Savers, Unique, etc. 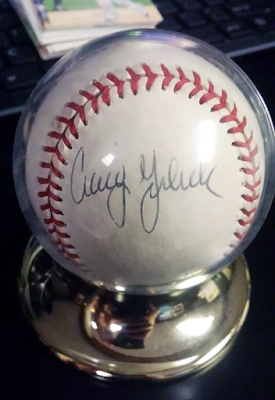 With that in mind, let's get back to the autographed baseball which led off this post. After serving as decoration for several years, I finally got back around to identifying the handwriting. At first, I thought it might say "Steve Carlton" and my heart skipped a beat at the thought of finding a 300 game winner's endorsement at such an establishment. 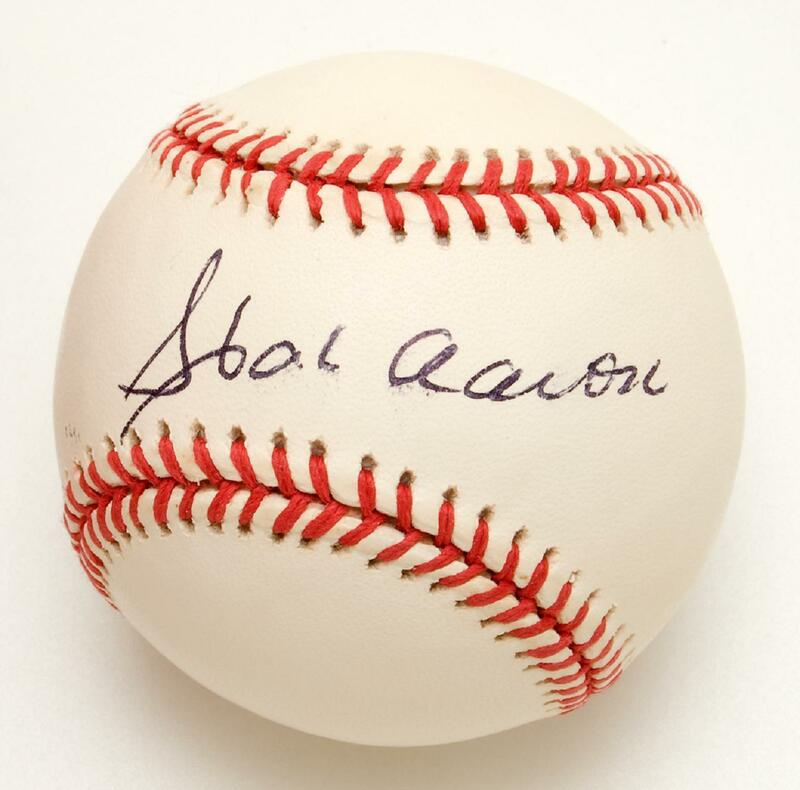 Of course, rationality set in after I discovered that Carlton's signature looks nothing like the one above. I mean, surely no one would so foolish as to dispose of something so significant so carelessly, right? I was not having much luck myself - I'm not much of an autograph seeker and I don't have the knowledge nor am I aware of the proper outlets for such research. Therefore, I took to Twitter to do a little bit of crowdsourcing - surely someone out there might be able to give me a lead, even if it was just a minor league scrub. These authenticated examples of Hammerin' Hanks Hancock sure do look the same to my untrained eyes. 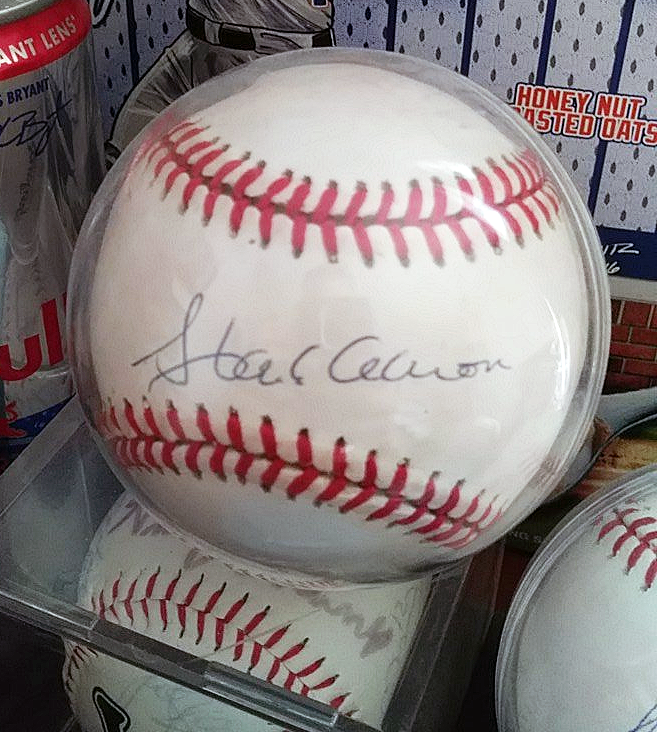 Hold the phone - could it actually be possible that my sister-in-law and I had stumbled upon a baseball signed by Major League Baseball's all-time home run king on a dusty thrift shop shelf for pennies on the dollar??!! Craig Grebeck, Mike Marshall, Ethan Moreau, etc. were cool and all, but this sounds way too good to be true! 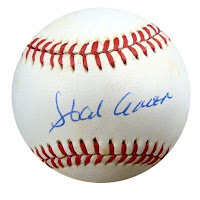 Now, I'm going to rain on my own parade here - while it certainly looks like a signature from the hand one of the top five greatest players to ever take to the diamond, there could easily be more than meets the eye. The cynic in me is more inclined to believe that this disposed of ball is more likely the product of someone practicing their forgery than the real McCoy. As the old saying goes, "if it's too good to be true, then it probably is." In the end, I'm certainly going to have to get this thing authenticated - the potential is far too great to leave it open to question. 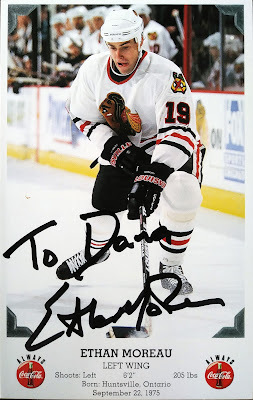 But, like I said, I don't deal with a whole lot of autographs or high end memorabilia - can anyone here on the blogosphere enlighten me as to the proper channels? Either way, this still ranks as one of the most exciting finds of my life. My sister knew she was giving me a generous gift.... however, who knew just how exceptionally generous this gift could possibly be?! 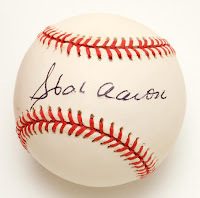 A Hank Aaron autograph found buried on a thrift shop shelf... eat your heart out, Macklemore! Whoa! Yes, yes it is the find of a lifetime. I totally saw "Stan" there too. I really need to go to the Goodwills by you. That's amazing! I hope it turns out to be legit! I hope it is a legit Aaron. Good luck! I saw "Hank Aaron" the moment I opened this post. Of course, whether it is the real McCoy is another question. Hope it is! That’s awesome. Hope it’s legit!